I have been meaning to read this book for ages, or ever since I first saw a copy of it propped up at a Barnes & Noble store about 4 years ago. It just kept getting pushed down the list as more boring, pressing, business-relevant information came to light. When I was planning what to take on my vacation to read, this book was grabbed first and I’m so glad it was! The book is started in a kind of Quentin Tarantino-esque manner by giving you a glimpse at the pivotal plot point first and then taking you into the story and building back up to that climax. 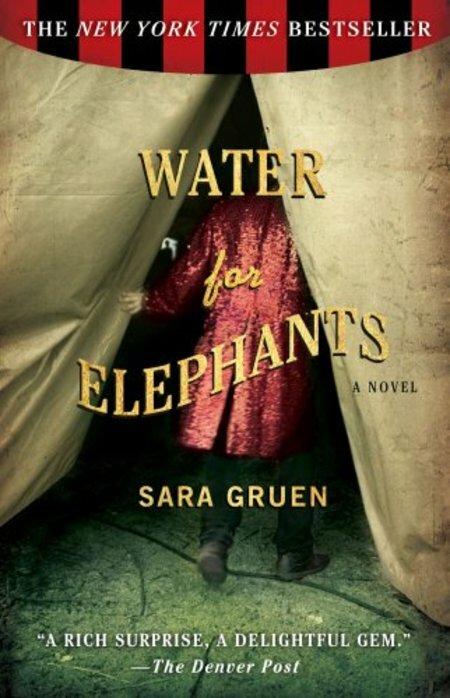 Ms. Gruen expertly transports you from the present life of the aged Jacob in an assisted living center back in time through his personal reverie to his intoxicating life as a First of May in a Depression Era traveling circus. You see the drastic difference between the vigorous young man he once was and the ailing elderly man in his 90s he has become. You get lost in the telling of his past, and so you feel the same jerking the old Jacob feels when pulled back into his life in the home. I wanted to curl up inside his memories and ignore the harsh realities of aging, just as he did. The descriptions of the circus and the rough lives of the performers and laborers behind the great shows are dead on and you can tell the author did a lot of research and approached the subject with respect and a need to “get it right.” A true behind-the-scenes look at circus life is rare, especially the darker side of the spectacles. My heart soared, raced, and broke with the rollercoaster telling of lust, romance, jealousy, rage, and triumph. I devoured the book in an afternoon. As I often do when reading a truly excellent book, I started to get anxious and distraught as the number of pages to the back cover began to dwindle and I realized I would soon have to leave this wonderful world. I was honestly surprised when the climactic moment arrived and the plot twist was revealed. Ms. Gruen made the gritty, beautiful world dance with her words, and left me craving more. I also now want to learn Polish and adopt a retired circus elephant, but I think instead I will have to rent the movie version and see if they did justice to the brilliance of the carefully, lovingly crafted written version that has taken my dreams hostage.